As I write this, I have 32,000 songs in my pocket, and my iPod will play them back to me however I want, from a set playlist to a completely random one. Furthermore, I can play that music on anything from a simple set of headphones to a networked sound system connected wirelessly throughout my house. In short, my music goes where I want and does what I tell it to do. And it’s not just me: recorded music is everywhere. We have access to it through broadcast radio, satellite radio and the Internet; it can be heard in the soundtracks for film and television; it blares out of passing cars and iPods; and it serves as “white noise” at everything from doctors’ offices to supermarkets. And none of us needs to know the slightest thing about music for any of this to be possible. Now try for a second to imagine a world in which music is entirely ephemeral. A performance exists only so long as the musician is playing; once each note has been completed, the only record of it is in the memory of those who heard it. And while the form of a piece of music – its melody, tempo and so forth – can be written down, the character of an individual performance can be appreciated only in the moment. That was reality for generation upon generation of our ancestors. From the dawn of time until about 100 years ago, music was a rare treasure. To be sure, there were opportunities to hear music: orchestras, traveling musicians and family ensembles entertained at social gatherings and on special occasions. But if you wanted to hear music at the drop of a hat, you could either learn an instrument or start singing. Nobody had the kind of ease and access that we now take for granted. 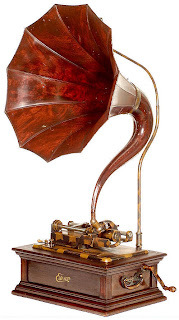 All of that began to change when Thomas Edison invented the phonograph in 1877. The device used a steel stylus to etch sound patterns onto a rotating tin cylinder, and could then reproduce those sounds. Competition between Edison and fellow inventor Alexander Graham Bell helped spur steady improvements in recording technology, but it wasn’t until the invention of a coin-operated model in 1889 that a demand for music recordings became apparent. That demand would grow over time, but underdeveloped technology and prohibitive costs prevented recorded music from being much more than a novelty. It wouldn’t be until the 1920s that those hurdles would be overcome and record sales would begin to outsell sheet music. 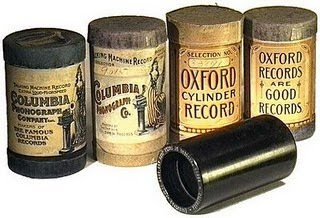 The development of recording technology was one of the major factors contributing to the development of the American music tradition. Until this point, there had been two channels for musicians to learn new songs: either by written sheet music or by live, oral instruction from one musician to another. The former was the primary channel for classical music traditions, while the latter was the primary channel for the music of common folk. But recordings opened up a third channel. Now musicians could hear a single performances over and over again, with all of its individual subtleties. Furthermore, they could now acquire recordings from many different artists far and wide, covering many different styles. Without being able to read a note of sheet music, an amateur musician could now challenge himself to learn the complex arrangements used by the most talented musicians of his day. And without the preconceived notions of classically trained musicians, the same musician could combine many different styles and create new sounds – which in turn could then be copied again by other musicians. Recordings also changed the way in which music was made. In the early days, the limits of the technology forced artists to make certain concessions in order to be heard on the recording (for example, using tubas in the rhythm section instead of bass). Later improvements in technology allowed in-studio producers to not just capture the music precisely, but to manipulate it and create entirely new sounds. The advent of recorded music set the stage for a creative explosion at the same time that African American musical expression was reaching a tipping point. Slaves had brought African music with them and had merged the fundamentals of it with elements of European music. After the Civil War, the music proved popular with white audiences in the form of traveling minstrel shows, which presented African American culture and music with mockingly humorous overtones. But hidden underneath the simple music that was portrayed to mainstream audiences was a richness and sophistication that would soon blossom. Even before recordings, newly mobile African American musicians were beginning to develop blues and jazz into distinct art forms; the recordings would only hasten their spread and influence. And even though the listening audiences would largely remain segregated, white musicians would freely copy African American innovations. Country, folk, bluegrass, rock and even vocal pop would all owe a huge debt to the new music. It seems ironic that one of America’s most cherished treasures – its musical legacy – would ultimately owe its origin to the most heinous part of its heritage: slavery. Yet we can trace a direct line back from today’s top pop hits to the spirituals and work songs of slaves. And perhaps it is a testament to the power of music that what was created under those conditions ended up becoming the sound of an entire nation, if not the world. The early recordings that I have focused on first may be difficult to listen to for more reasons than just their unenlightened racial views. The recording quality in many cases is poor, and it may take several listens before your brain is able to start filtering out the hissing and popping to appreciate the music underneath. Even then, much of what you find may sound hopelessly outdated to your modern ears. Fight the urge to skip these early tracks: they are worth the effort. If they sound unremarkable or simplistic today, it is only because the intervening century’s worth of music makes us take their innovations for granted. When you listen to these tracks, you are listening to the birth of American music. When you realize that at the time nothing like this had ever been heard before, you start to understand their significance. For example, Paul Whiteman’s music may not even sound like jazz to us today, but if you compare it to classical music, you will see why people thought it was revolutionary. And you will hear the seeds of the big band craze of the 1930s and ‘40s being planted.